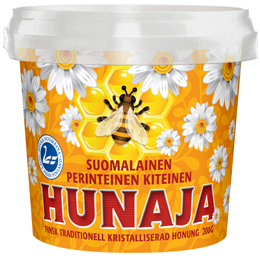 Finnish honey generally crystallizes relatively quickly. Honey that crystallizes is normally churned, which makes it soft and microcrystalline. Our Traditional Crystallized Honey is left to freely crystallize the way Finnish honey does at its most natural. This crystallized, hard honey yields to the spoon and melts in the mouth, just like in the olden days. An olden-day honey is now also available in a small tub for picnics, for the cottage, for home.that has been left to freely crystallize and become hard. EXPORT PRODUCT.